Recipes are such a tricky thing...especially ones you come across on the internet. They can either turn out fantastic or go horribly, horribly wrong. The blame for it going disastrously wrong can lay either on the recipe creator or it's an operator malfunction. In the case of The Mudslide Cupcake, I'm gonna share the blame. The Mudslide Cupcake started as a great idea. They even look good. And why shouldn't they? 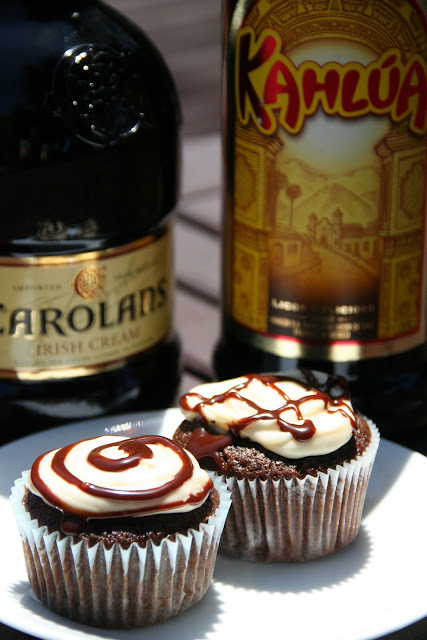 Another cupcake I could make with booze and chocolate, like the these. It was meant for greatness. However greatness was never achieved. Somewhere between the recipe I choose and the final product, all I can say is... someone messed up! The cupcake was extremely dense and didn't have much flavor. I will be the first to admit I didn't follow the recipe exactly. But then I hardly ever do. I tweak, I substitute flavors, and usually I am met with success. I had half eaten cupcakes, that's how bad it was. I won't share the recipe with you because, well, I don't recommend it. And it may not be the creators fault so I don't want to insult anybody. But here is a list of folks who have tried other versions and have seem to have been successful. Have you ever horribly screwed up a recipe? Let me know so I don't feel so bad! Bummer!!! That happens to me more often than I care to admit. Of course, if I'd follow recipes more carefully I would most likely have better success!! At least you got some good pics!! Can't wait to see the next try!! San Diego Food Blogger Bake Sale Success!